See more objects with the tag borders, manufacturers, unfinished, accessories, handkerchiefs, flowering vine, lozenge. See more objects with the color saddlebrown black grey dimgrey darkolivegreen or see all the colors for this object. This is a Uncut handkerchiefs. It is dated ca. 1870 and we acquired it in 1916. 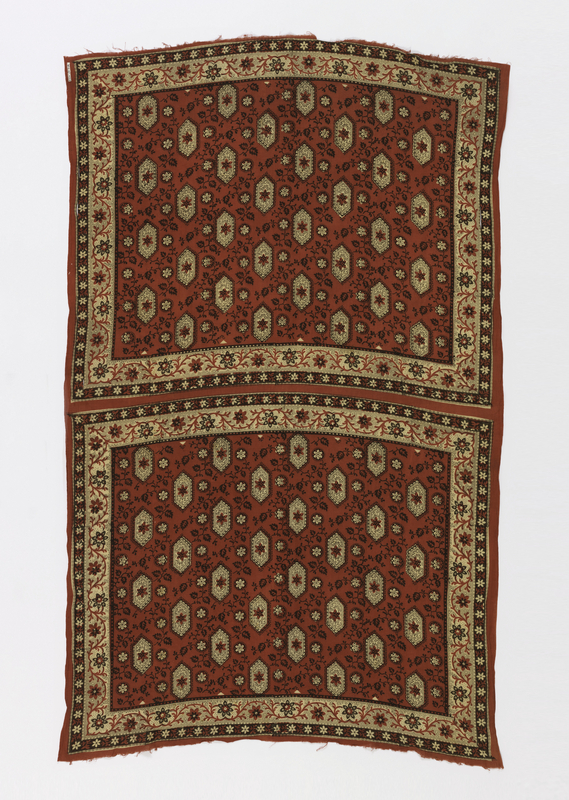 Its medium is cotton and its technique is block printed and resist printed on plain weave. It is a part of the Textiles department. Bandanas were typically sold by textile printers in uncut lengths, to be cut and hemmed by individual merchants. The size of 31 inches square, smaller than handkerchiefs of the past, was standardized by the English in 1829, as bandannas became more commonly used as pocket handkerchiefs rather than head or neck scarves. 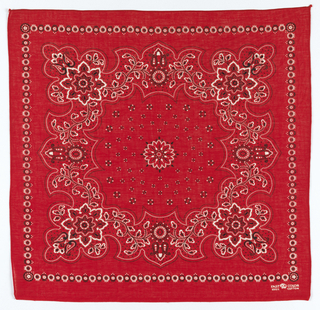 This example maintains the bandana’s size and general format, but lacks the brilliant “Turkey red” color and engraved white patterns that characterized the enormously successful bandanna industries in Glasgow, Scotland and Manchester, England. Attributed to the United States, it is a cheaply printed example in which carved wooden blocks were used to apply a paste resist to reserve the white areas, and a dark brown ink to others, as can be seen by the mis-registration running vertically through the center of the piece. This object was featured in our Object of the Day series in a post titled Two Squares.